Description: A fantastic freeware title that allows you to convert (or batch convert) almost any type of audio format into another. 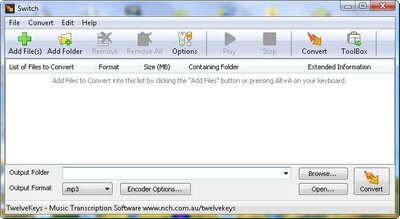 Teaching Ideas: This great audio freeware utility allows you to convert (or batch convert) many audio formats into another including: wav, mp3, mp2, mpga, m4a, ogg, avi, mid, flac, aac, wma, dct, au, aiff, ogg, raw, msv, dvf, vox, cda, atrac, gsm, dss, sri, shn, wav, dss,mp3, au aif/aiff, gsm, vox raw, ogg, flac aac, mp2, m4a, wma. A great idea for use with this would be to convert the many copyright free midi files that you may come across (think www.classicalarchives.com) into wav for use with CD distribution.